Hydrogen fuel may be used on a larger scale in future transportation and stationary applications. The overall goal of the project was to examine potential environmental effects, focusing on the impacts of various hydrogen production pathways and use on the oxidative capacity of the atmosphere, long-term stability of the ozone layer, and climate changes. 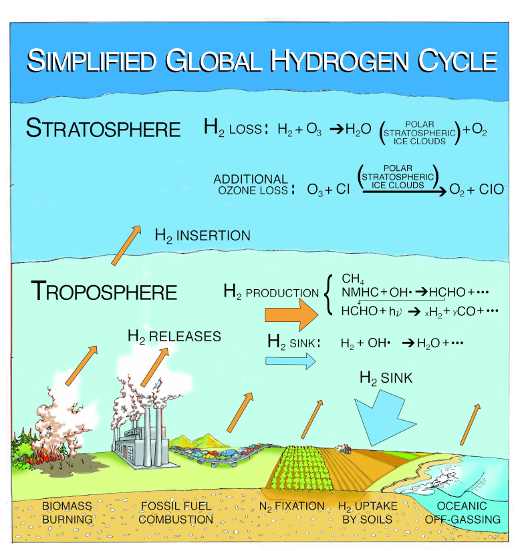 Emissions from the major technologies for generating hydrogen were compiled including: natural gas reforming, coal gasification with and without carbon sequestration, wind, solar, and nuclear power to generate hydrogen gas by electrolysis of water. This information was supplemented with data for the criteria pollutants from the U.S. EPA National Emission Inventory for on-road mobile, non-road mobile, point and area sources and results of life-cycle analyses of alternative vehicles from the GREET 2.7 model. Next, the projected emissions were used as input to the GATOR-GCMOM model, which predicts tropospheric and stratospheric concentrations of gases and aerosols including CO2, CH4, O3, H2, water vapor, VOCs, and particulate matter. Because of the importance of H2 uptake and conversion by soils, the model’s soil routine was updated to mechanistically simulate H2 behavior. The GATOR-GCMOM model-predicted concentrations of H2 and greenhouse gases were used to estimate effects on climate such as changes in air temperature, cloud production, ozone levels, and production of photochemical smog. The concentrations of the criteria pollutants (CO, lead, NO2, SOX, ozone, PM2.5 and PM10) and greenhouse gases were compared to health effects levels and national ambient air quality standards to evaluate potential effects or benefits to human health and ecosystems. Other possible environmental effects from the hydrogen generation or use technologies were also identified. Overall, the results indicate that switching from the existing fossil-fuel on-road vehicle fleet to a hydrogen fuel cell vehicle fleet will reduce air pollution, while decreasing health and climate problems and costs.